Energetic and engaged triple threat Peter Fernandes is one of the fastest rising stars out of the most recent graduating class at the Soulpepper Academy. He’s nominated this year as a key player in not one but two Outstanding Ensembles- Arthur Miller’s World War II slow-burn one-act Incident at Vichy and Suzan-Lori Parks’ transcendent epic Father Comes Home From the Wars (Parts I, II, II), both with Soulpepper. He stopped by the Nominee Interview Series to take us behind the scenes of both productions and illuminate how their historical stories are terrifyingly all-too-relevant today. Okay, well not necessarily with theatre. I guess with theatre in the sense of performing, my mom and my dad would make me perform on small stages hosting. Like, I’m a little kid hosting the talent shows and stuff. I was born in the Middle East and there’s this place called the British Club, and it’s not a glorified YMCA, but a big deal kind of thing, and they had these functions, and I’d be hosting those. They’d have a troupe of little kids hosting things or singing songs, and that’s how I got into performing. But in terms of theatre, it would have to be like in grade 6, I did a production of the Wizard of Oz, and I played the Lion. One of the Lions, because it was cross-cast or something. And that would be, I guess, my first theatre. How has the Cowardly Lion informed your career thus far? No joke – there’s a part where the Lion meets the Wizard, and he faints. So I did that, and I got a laugh from the audience, and I was like, “I need this always.” [laughs] That felt good, and so I think that’s kind of what has brought me to a lot of the parts that I’ve played recently. You came up through the Soulpepper Academy. What were your most formative experiences from that? The thing about the Soulpepper Academy is, once you’re there, you start working with the people that have been there since the beginning, almost right away, and you work with them as an ensemble, as a co-creator. So I’m trying to think of specific experiences. For example, the creation of Spoon River. Right? I’m in there with Oliver Dennis. I’m in there with Diego [Matamoros]. I’m in there with different generations of the Soulpepper Academy, and you’re there creating and playing off them. Sure, we need classes to begin with to create a vocabulary together, this notion of playgrounding, and to kind of break down some of the walls that we built up, so that we’re not so intimidated in a room like that. But it’s experiences like that in the company where you’re looking to somebody that you’d usually look up to, and you still look up to, but you’re looking to them as a peer, as a co-collaborator, as someone who will respect your ideas as much as you respect theirs, and you can feed off of that together. There was a moment in Spoon River where Albert [Schultz] sent Oliver and I off to a room. “Okay, you have these two poems, they’re together. Do something together,” and I went “That’s incredible. I get to do that?! Incredible. So there are moments like that where you’re asked to create with these people, these mentors. Everyone in the Academy is assigned an official mentor from the core Soulpepper group. Who did you have? I had Derek Boyes, who is AMAZING. Such an incredible artist, and such a great mentor. So open to hearing what my struggles are, or being able to help my work move forward. We’ve really grown to be close. I mean, he is my mentor, he is my friend, he’s someone that I look up to – I think that’s the incredible thing about the Soulpepper Academy. Having mentorship is very, very important. I lucked out because Derek was so willing to give his time to me, and so willing to offer insight into the company, into his journey as an actor, and it was incredibly helpful. For both the great, amazing times, and also the hard times when I felt insecure about my work, he’d be there to help me unpack it. Even if not assigned by a specific theatre company, there are people that you look up to in the theatre community, that I think are willing to do that. To really appreciate that relationship, and look for guidance, I think is very important because so many people are looking for help in this industry. And so through that, it’s been such a great opportunity for me to be a mentor and take some of what Derek passed onto me to things like the City Youth Academy. I also sometimes teach through Soulpepper, so it’s really important for me, this passing down of mentorship to generations. What stands out in your memory about Incident at Vichy? Arthur Miller is a very, very good writer. That’s the hottest take I’ve heard all day. Nobody could have guessed! [laughs] No, he is incredible, and I’m really surprised I had not heard of [the play], considering how incredibly relevant it is now. And how upsetting that it could be so relevant right now. It taught me about the necessity of the theatre. Necessity on a very practical level as an actor, that these lines are there for a reason, nothing is just thrown away – he’s smarter than that. And I think Alan [Dilworth, the director] really got that out of us. Just how it spoke to the day. What happens when hate is spread in a way that goes against your preconceptions of hate, how unbelievable something can seem, and yet it can still happen. It really spoke to how scary it can be, and what fear can do to people, and how much you want to think that things can’t happen again. 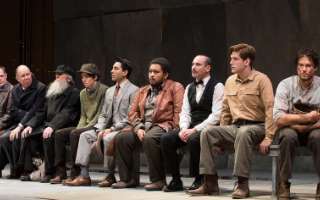 The show is written for a cast of all European Jewish men but Soulpepper cast diverse performers. How did the casting, both racially and gender-wise, inform the contemporary feeling of the piece and its relevancy? Without explicitly saying or removing lines or pointing out “Oh, I’m black,” or “All these people aren’t white,” without doing that – hearing certain words being said through someone of colour informs that text. It was such an incredible experience. I’m trying to remember a line that I had in there, it had a lot to do with Lebeau and his self-hate. He’s wanting to separate from identifying as a Jew so he attacks other people in the show about looking more Jewish than he does. He has a lot of text supporting that he doesn’t necessarily identify as that. And hearing that, and hearing some of the text coming out of a black male, and the self-hate that sometimes you feel, and separation you want from your community, it speaks to the discrimination that’s happening today. Kawa [Ada] also had some lines about how everybody has “their Jew”. And he lists the discrimination that’s happening all over the world. Hearing him speaking as an actor of colour and having an ongoing crisis with refugees at the same time- instant connection. You can say that that connection can still be made with any actor, because of how well Arthur Miller wrote that piece, but with actors of colour, you’re face-to-face with that. You can’t shrug that off and say, “Oh, I was only talking about back then”, it makes it immediate. They’ve been making strides recently but Soulpepper is still a predominantly white company where you’ve often been tasked with playing roles written for white men. Is race something that then gets discussed as relevant to those productions or is the casting meant to be colour-blind? Your character in Incident at Vichy was a painter, one of only two artists in the group. How does that societal role play a part in LeBeau’s experience and reaction to the events of the play and the characters around him? He’s young, he’s younger than me, and I forgot that when I first approached this play. It speaks to a missed artistic opportunity, a stifling. He’s forced to stay at home, and he says this throughout the show, he couldn’t bear leaving. He was so afraid. He had to escape his own confines but he was cut short. He doesn’t know what it was gonna be, what he could have done, artistically what he could have expressed. You see that he couldn’t go out before, so that influences his art, and it speaks to that discrimination. That discrimination can get in here, it can get in your head, and can really cause a missed opportunity for a larger influence in the world, which is what art is. Alan Dilworth’s staging confined the actors to a single bench for the majority of the piece. How did that physical limitation inform your performance? Physically, to have that constraint there meant that any time you stepped off, any move, was a larger deal. There’s that pressure- you’re there in a room, nobody’s speaking in the first minute of the show- it speaks to that anxiety and that pressure that builds, and then bursts out. We spent time in that physical language just seeing how our body responds to anxiety, pressure, to these words that are in the text or words that we related to the text. We spent time exploring what that physically did to our body, and then pared it down. What that chore demands goes hand-in-hand with the text, too, just the importance of what you’re saying and the need to say it. It has to have so much need to say some of the things in that show before you even take a breath and have the words come out of your mouth. And I think physically, having us all on the bench, it highlights that. It highlights that and the importance of your body and your movement in the same way the text does to your voice. Is there anything else you want to say about Vichy before we move on? I hope we get to do it again. Because it will be informed, even more. What is being talked about right now is just so chilling sometimes. We’re not supposed to relate so well; we should have been a little bit more far-removed. It’s a credit to the writer. You were also part of one of the most-nominated productions of the year, Father Comes Home from the Wars. Tell us about working with that cast. They are incredible. They are an incredible group of artists. So giving. So open. And so willing to create together. Watching them work was, and this gets said a lot, but it really, truly was inspirational to be in that room. Especially a room that was majority actors of colour. I wrote about it in Intermission, Father Comes Home is very important to my trajectory, I feel, going forward. And it’s because of the way that everybody led. Everybody as co-collaborators led that production forward. And it was an incredible experience to work with these people who were brilliant. I’m just gushing over them. I’m verklempt right now, just thinking about how those artists work. 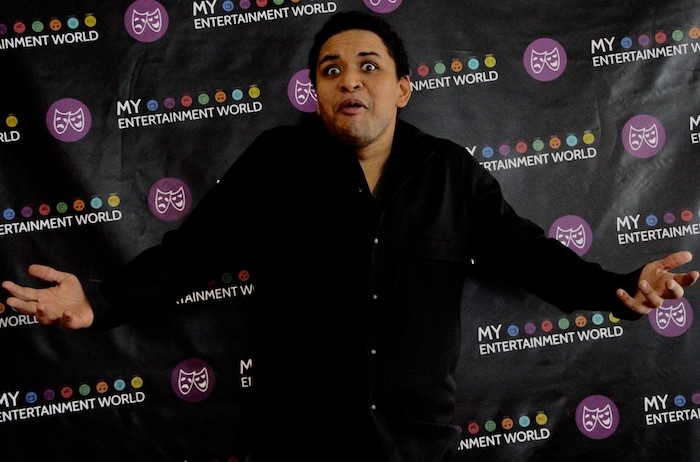 And how they took tragedy that hit our community and created a space- that’s what Weyni [Mengesha, the director] does- everybody just created this space where it was okay to be angry about it, where you feel safe to be upset about it. They created a space where you could use it in a positive way. You could let it inform the piece. It was a real defining moment. Weyni is one of the fastest-rising stars in Canadian theatre, tell us about her room and how it’s different from other people’s. She framed the conversation around how we all became storytellers. And that opened us up, because some of us, how we became storytellers, that’s different from how we became actors and performers. That’s a very vulnerable place, and to have a room where you open up about how you become storytellers, you yourself became a storyteller, and then you witness other people opening up about how they became storytellers, and then together you tell a story. It’s a small little activity, but it’s really huge, because then we’re all informed a little bit more about everybody. We’re instantly a little bit more in touch with how everybody’s telling the stories, and then that creates one layer where we’re all on the same page. And again, creating a space where we can bring the back-to-back shootings of Philando Castile and Alton Sterling- creating a space where you can feel free to bring that into the room, because you’ve already become a little bit more vulnerable. Creating that space is what she did, it’s incredibly safe space. Sometimes you can be the most vulnerable you’ve ever been, but you are safe in that space, and you feel like you’re all in the same world and that you are all storytellers together. It’s hard because it’s this indescribable thing, this connectivity you have with your other actors, and the team, and the crew together in that room. It was almost like magic. 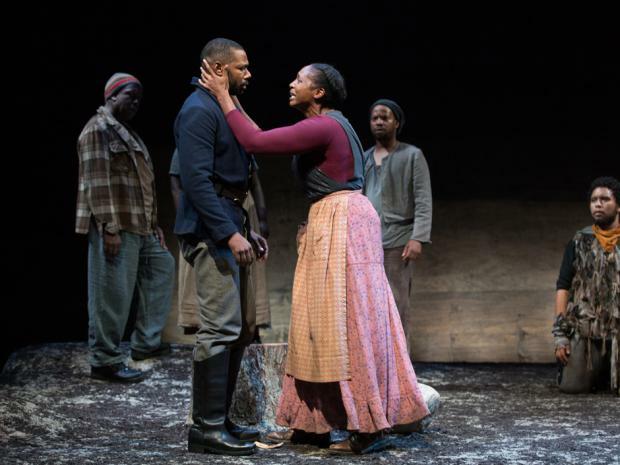 Suzan-Lori Parks works with very stylized, poetic language – is that hard to master, especially at such a quick pace? It can be. You know, reading it beforehand, before really working on it, it can be intimidating. But if you remove the idea that you have to speak it a certain way because it is poetic, and you just really go down to the thought and the intention of your character to the other person, it becomes less. You can really dive into the work and really pick it apart and really pick out the poetry, and that can inform the way you think it through, but you’re connected to another person, and it will reverberate more in the audience if you’re not worried about making it poetic. We just think the thoughts that are on the page, and say it to the other person. So it’s challenging when you read it without that, right off the get-go, and you’re going “Oh, I want to make sure that everybody gets this, and everybody gets that”. But they will, because she’s a good writer. They’ll get that without you having to gild the lily. It’s hard at first, but once you’re there with other people, and you’re reading it together, and you go back to the root of the thought, it becomes simpler. Part three of the play contains some magical realism, in large part created by the presence of Odyssey Dog, a speaking human dog. Tell us about that character and what he means to the play. His name is Odyssey Dog, and he holds the story. The play is very loosely based on The Odyssey, and in the original, in The Odyssey, the person who does that, in that part of the saga, is Ulysses in disguise. So once you start connecting those things together, you realize that he’s the storyteller of this huge journey leading forward. So I think that’s his place, it’s him holding the story. It’s him looking forward and back. How did you decide on the right balance between humanity and dog qualities? I’ll go back to clear thought and intention. I have to thank Weyni, of course, and also Kelly McEvenue, the Alexander coach at Soulpepper who helped me find him physically. But you have to trust that your body’s gonna follow your thought and your intension, so if you’re thinking “I need to follow things with my nose”, because that’s what a dog does, “I need to be aware that my tailbone is a tail”, you go to the very extreme. I did, at some point, just go all the way, “I am a dog”. You go there. You let that inform physically where you are. And then you bring back the text, and then you wind up in this middle place where you can be standing and still leading – because you’ve just been thinking through that, leading through your nose, or you have a little jiggle in your tail. And all of a sudden, that’s in your body – you kind of have to test the waters of how far you can go one way, physically, so that your body gets comfortable moving in that capacity. Odyssey Dog is the broadest comedic element of the play but his featured scene comes right before some of the darkest drama. Were you ever wary of taking the audience too far down the funny road until it was hard for them to come back? That’s important. I think that tonal shift that happens is important. And I don’t think it’s the first time that it’s happened- you need that little bit of light to highlight the fall that happens after. You get distracted for a moment, and you have a feeling that things are going to be one way, but then you’re brought back to reality, that, no, this is the story, here. But you can’t forget that. It makes you forget for a little bit– it relieves you of the pressure of feeling loaded with sadness or something in that capacity. It makes you forget that for a moment, just so that you get a little breather, and then it highlights [the tragedy]. I think they go hand-in-hand. Without it, you get a different experience. Without a little bit of levity, you don’t get aware that you can so easily be distracted from the fact that there can be tragedy. Did you have anything you wanted to add about that show? It’s very important to have actors of colour in shows. Some of the discussions that we had in that room- sometimes it’s scary. It’s really hard to bring out how you are hit by certain things in the world. Into the rehearsal hall. Not always, but sometimes it’s hard. You’ve often been the only person of colour in a particular Soulpepper production, right? Yes, sometimes one of a few. So sometimes it’s hard. And this is not only speaking to Soulpepper. Generally, for a lot of what I’ve seen and also been involved with, it’s just been- I don’t want to bring up the fact that my experiences of black men kind of influences this a little bit. I don’t wanna bring that up, or I don’t wanna say “Hey, this projects something to people of colour”, sometimes. Because you don’t wanna be the outsider. You don’t wanna be the person that’s stirring the pot. Do you think some directors would react negatively to you bringing those issues up? I don’t know, but sometimes people are wary, because they’re not equipped to handle a conversation like that. Some directors maybe aren’t equipped, so there’s a “Oh, we’ll talk about that later”, and sometimes, that informs casting. “Oh, if I do this, we’ll have to have a discussion about this-” and you’re already way ahead. Discussion is important. So whether or not you’re going to have an informed [opinion], you shouldn’t be afraid of that discussion. And it will take discussion to determine how much you let that infuse your part. Don’t be afraid of having those discussions, and talking it through. That’s what I wanted to say [about Father Comes Home From the Wars]. I even said it in Intermission. It made me feel like my voice was important and valued. You’re part of the second generation cast of Alligator Pie, taking over from the actual creators themselves. What was that process like and what are some of the ways you’ve been able to make it your own? [The creators- Gregory Prest, Raquel Duffy, Ken Mackenzie, Ins Choi, and Mike Ross] were really generous with showing us the framework, giving us the frame of mind of how they created it, and what values they had in creating it. They spoke to us about how they created this room where they were able to have fun and kind of remove themselves from some of the stresses outside that room, and develop a freedom to create. And so they gave us those values, they gave us a framework- a bigger framework than they had originally when they created it- but with those values, we’re able to bring ourselves to those parts. So yeah, maybe we weren’t able to create the music, but the way that we performed that music, and the life that we’re able to bring to that show, is our own. They were very generous, and they let us do that. They would just make sure that we stayed within the framework of the show that they had created. Generous is a great word to describe that group of people. Whose track are you doing? Oh, with the rap and the glasses? Yes! Yes, so much fun – I lucked out with that one. I was like “YES!” I remember watching it before the idea of doing the show, watching it and just going “One day I would like to be rolling around in a chair like that.” I thought it was so funny. So I got to play him. We did switch up the little things, cause I don’t play instruments. So Hailey [Gillis]- who’s a rockstar- plays what I was supposed to be playing in certain parts of the show. Do you have any fun kid-interaction stories from that show? Coming out [after the show]. We just finished on tour, and everywhere we go there’s always bubble-wrap after for the kids to step on as they leave the theatre, so when you kind of sneak out to go and see them, they’d be jumping, jumping, jumping, and then they’d catch eye with you, and they would just freeze. And I think that’s hilarious. Do you tell them or do you keep the magic alive? I let them know there’s a whole crew of people that go into a show. So what you’re seeing on stage isn’t just the work of the five people you see onstage, there’s a whole team that you don’t see, that you need to appreciate as well. I let them know that there are some people that do magic, but they are also backstage, and they help us do that. Kids get so excited to meet you, and instantly so shy, then they go hide behind their parents. Tell us about Passing Strange with Acting Up Stage. Not a lot of people know it, but I saw it on Broadway when I took a trip out there years ago, and it affected me so much as a black artist. And every time I’ve revisited the piece- because then there was the movie that came out, or the live recording of the last show, and then whenever I’ve revisited the soundtrack- it’s revisited me in different ways based on where I am in my life, so it’s been a dream of mine to do this show. And I am IN IT RIGHT NOW, which is crazy. I’m freaking out that I get to do this show. Just to be involved in that show, in any capacity, and here I am, I get to be in that show. I am doing Peter and the Starcatcher at the Citadel Theatre. I’m very excited. That also quickly made my list as one of the shows that I wanted to do. I’m so stoked right now. I get to play Smee in that, which I’m very excited for. [More Information Here]. Do you have any other dream roles? Coalhouse Walker in Ragtime; I would love to play that, I love that music. I’d also love to play Horton [in Seussical the Musical]. It’s a lot of musicals. I’m very into musical theatre, so a lot of these roles are gonna be like, “I wanna play this in musicals; I wanna do musicals”. Please keep having discussions about creating space in theatre for people who don’t feel that they have space, or feel under-represented. I didn’t use to think about it a lot when I was in theatre school, and the more years I spend in the theatre community, the more important it has become, and especially being given opportunities to teach and be mentors for young artists- even though I still seek mentorship- it just becomes more and more important. It’s become way more important in my life to make sure to give under-represented voices opportunities. And to keep talking about it. It’s hard to talk about because people get in a very vulnerable space when they start talking about it. And people can get defensive. And sometimes you just have to go through that, you have to go to that space that seems negative when really it isn’t, you’re just getting deeper into the discussion of it. I’m learning every day still, about intersectionalism, in that capacity, being more open to ability. I’m not as well-versed in that, and I actively need to do work to stay on that. I actively need to do my research to have discussions with people when I don’t understand their point of view. And more people need to do that. More people need to do that and realize that we can create space – there is room to create space for a lot of voices that are not being heard right now. Especially now. Especially when everybody’s talking about “This is the best time to put up a fight; we have to use our art to do it”. And I agree with you. It can’t be the same. It can’t be the same as ten years ago. We have to be more informed. And that’s hard. It’s hard to admit that you don’t know things. I don’t know everything. So you have to actively try to move yourself forward in this industry, in terms of opening up your mind to other voices. I just, I have to say that because it’s become so- it affects me in such a profound way, recently. And sometimes I have to shut myself off from it, because it’s so hard to keep hearing some of the excuses that happen, that you have to separate yourself a little bit from it. But you have to take opportunities like this to reinforce, to keep having discussions about people who are under-represented.